UserGate Mail Server is a solution for secure corporate e-mail management. It basic features include domain & account management, Web-client, distribution list support, remote accounts management, LDAP support & a powerful and flexible rules system. The product supports SSL, POP3s, SMTPs and IMAPs protocols for secure e-mail access. Additionally, UserGate Mail Server includes integrated Kaspersky Lab & Panda Antivirus modules for e-mail scanning. The product supports SSL, POP3s, SMTPs and IMAPs protocols for secure e-mail access. 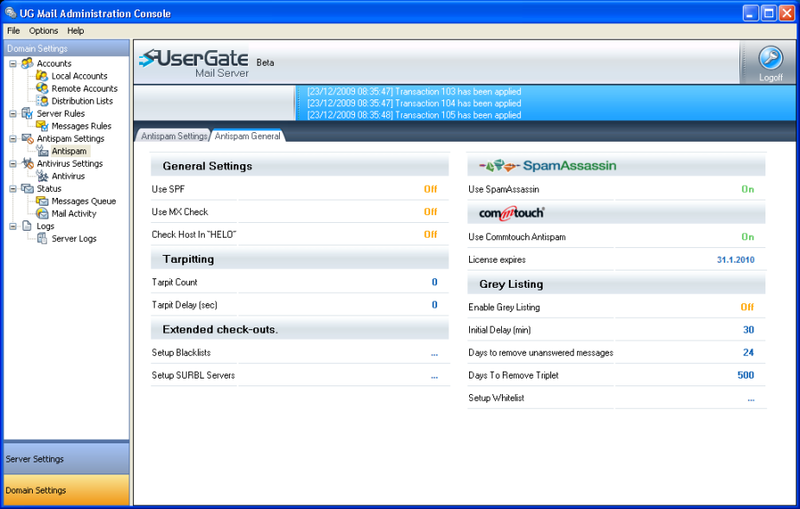 Additionally, UserGate Mail Server includes integrated Kaspersky Lab and Panda Antivirus modules for e-mail scanning. UserGate Mail Server's backup feature will help you minimize the risk of data loss. The program supports scheduled backup and recovery from the backup file on the server where the Mail Server is installed, as well as on any other server. Qweas is providing links to UserGate Mail Server 2.2 as a courtesy, and makes no representations regarding UserGate Mail Server or any other applications or any information related thereto. Any questions, complaints or claims regarding this application UserGate Mail Server 2.2 must be directed to the appropriate software vendor. You may click the publisher link of UserGate Mail Server on the top of this page to get more details about the vendor.